If you want a compact, lightweight near-field active studio monitor that packs a real punch then the Neumann KH 120 A could be just what you’re looking for. Just as comfortable in a recording studio, edit room or OB van, this little gem is ideal for tracking, mixing or mastering in music, broadcast or post-production. The Neumann KH 120 A is a dense Active Studio Monitor intended and constructed for use as a near or rear field loudspeaker as part of a multi-channel setup. The speaker enjoys expansive headroom analogue input, versatile acoustical analogue control and a wide-ranging mounting range. The Neumann KH 120 A is one of the most commanding and flexible Active Studio Monitors available to industry professionals. 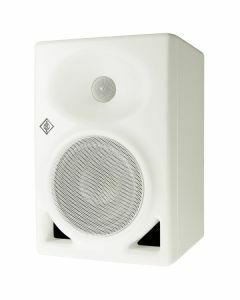 The KH 120 A’s Elliptical Mathematically Modelled Dispersion (MMD) waveguide technology provides a much slicker and circular off-axis response, permitting its use in a far more varied array of acoustic settings. Combined with the KH 120 A’s modern hardware mounting options, adaptability and variety are clearly situated front and centre in Neumann’s designs. The class AB amplifiers in the KH 120 A, its huge analogue headroom and long throw bass driver all total up to a hardy, reliable active studio monitor well suited in all applications for broadcast, music, post-production and project studio applications. Its tough manufacturing and build-quality which includes a titanium fabric dome, metal grille and compact aluminium cabinet lend mean that it is equally at home in a studio environment or outside in a broadcast truck. Weighing just over 6 kg, the Neumann KH 120 A offers all the power and acoustic quality professionals have come to expect from a high-quality near-field monitor, as well as the additional versatility they might not.